Sometimes, it’s not what you know about home improvement, it’s what you don’t know that is important. Disclosure: I am a compensated DIYZ-sponsored blogger. Opinions are 100% my own. Check out the hashtag #DIYGuys to find other cool posts about the app. If you’d like to check out DIYZ, The DIYZ App is free to download and is available in the Apple App Store for iPhone and Google Play for Android. For a limited time, the video chat feature is FREE! 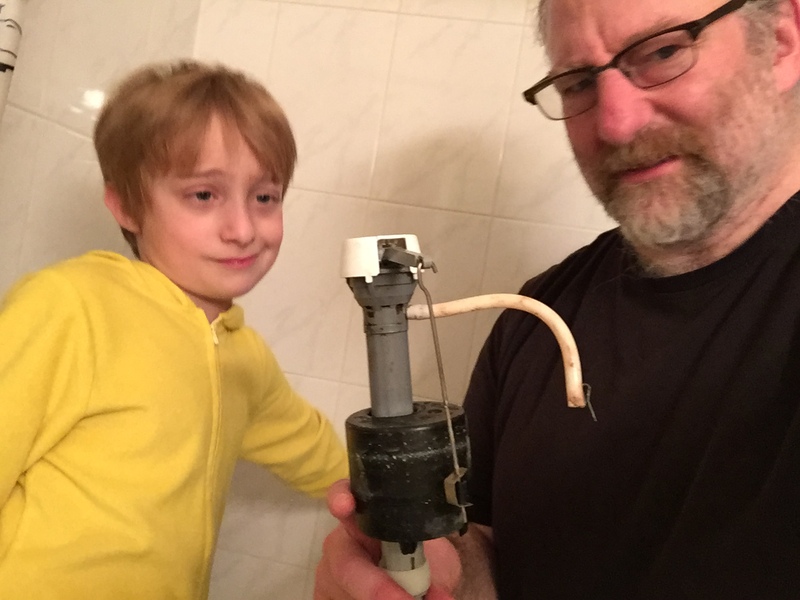 My son and I are a little afraid of the evil toilet fill valve. PLEASE NOTE: I am not a plumber, nor do I play one on TV. I don’t have any real plumbing skills or experience to speak of. My experience with plumbing usually entails checking out the issue, despairing a little, freaking out a lot, and finally calling a plumber who then comes over, charges a whole lot of money to do nearly nothing, while the whole time I watch like a hawk, trying to figure out what he’s doing so I won’t have to call him next time. One time, a guy came and literally just flicked the switch to fix a problem. It cost me $150 to have him do that. As he explained as I wrote the check- “It’s not what I did that you are paying for- it’s the knowledge to do what I did.” Needless to say, I never called that guy again. Over the years I have gained a little bit of knowledge. But it’s not just knowledge that you need. It’s the confidence to use that knowledge. And that’s not something I have a lot of. I’ve recently discovered the DIYZ app, which is a mobile app that helps Do It Yourselfers with a lack of confidence or knowledge to complete projects around the house. DIYZ stands for "Do It Yourself. Do It Wise." They have a vast list of over 50 home improvement projects that can be accomplished. They have easy to understand step-by-step videos that display clearly how to complete each project. They have TRAINED PROFESSIONALS on call who are ready to video chat with you to help solve any problems that might arise. If video chat isn't your thing, you can send them photos they can annotate, or just talk over the phone. It’s perfect for guys like me with a dangerous amount of knowledge (read: just a little) and a lack of confidence. The Project I chose to do. Our downstairs toilet has had problems for a while. I’ve thought of just having the whole toilet replaced, but financially that doesn’t make sense. It still works, it just doesn’t work great. One of the biggest problems has always been that once you flush, the water doesn’t get into it fast enough. As I mentioned above, I am not a plumber, but it seemed to me that the water valve was to blame. Occasionally I’d get no water through it, and if I opened the tank and massaged the water valve a little, a tiny stream would come out. When I was looking for a good DIYZ project to try out the service, this is one of the projects on the DIYZ list! SCORE! My 8-year-old son was with me helping me out. He videotaped and took some photographs, and of course, dressed up like a Pikacsuper hero with a sword and bow and arrow. Because, WHY NOT? An unscheduled stop to ... review the intructions. And it was! 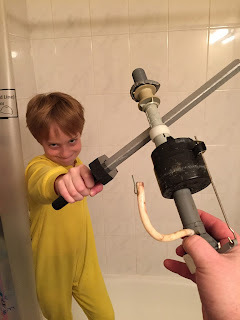 I completed the project on my own, with the help of my assistant! From reviewing the diagrams and the videos and the old valve (with an unscheduled stop to … ummm... use the facilities) I was able to figure it out. And when I turned the water back on and flushed the toilet, I was amazed to discover that it all worked properly! 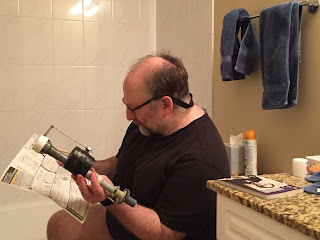 I felt like a plumbing hero! The plumbing hero battles against the evil Toilet Valve! And conquers it! All is right in the world! I am now looking for other projects around the house that might be on the DIYZ list. (Looking around, I see that INSTALL A DOOR SWEEP is also on the list, and that's something that is on my list as well!) As I mentioned there are over 50 projects, including building a breakfast tray, replacing a light fixture, installing a USB outlet, and much more. Here's a video of my son helping me. He says in the video that it is his first time using a sponge. I don't know if that's really true, he's at the very beginning of his plumbing career from this project I know he's building confidence to do his own plumbing projects in the future!